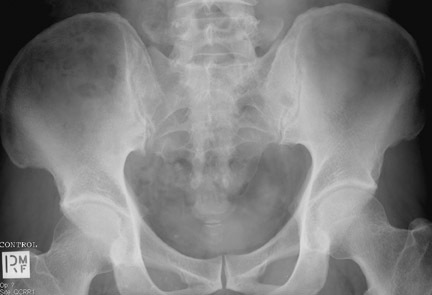 A radiograph of the pelvis showed a rounded well-defined lytic lesion in the sacrum, adjacent to the left sacroiliac joint in addition to the radio-opaque calculus in the distal ureter (Figure 1). It measured approximately 11 mm with a thin well-defined sclerotic margin.Axial and coronal CT showed the air density within the lesion (Figures 2 and 3). The sacroiliac joint was unremarkable. Intraosseous pneumatocyst should be differentiated from bone neoplasms and osteomyelitis by its characteristic imaging findings. Intraosseous pneumatocysts are benign lesions, therefore biopsy and follow-up are unnecessary. Catalano O, De Rosa F, Muto M. Intraosseous pneumatocyst of the ilium: CT findings in two cases and literature review.Eur Radiol. 1997;7: 1449–1451. 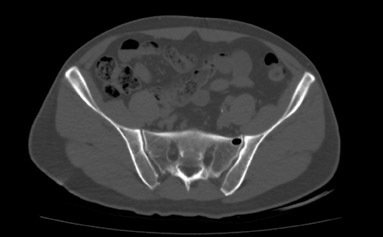 Berenguer J, Pomés J, Bargallé N. Sacral pneumatocysts: CT appearance. J Comput Assist Tomogr. 1994;18(1):95–97. Kitagawa T, Fujiwara A, Tamai K, et al. Enlarging vertebral body pneumatocysts in the cervical spine. AJNR Am J Neuroradiol. 2003;24: 1707–1710. Yamamoto T,Yoshiya S, Kurosaka M, et al. Natural course of an intraosseous pneumatocyst of the cervical spine. AJR Am J Roentgenol. 2002; 179:667–669. Linker CS, Peterfy CG, Helms CA. Case report 844. Intraosseous pneumatocyst of the clavicle. Skeletal Radiol. 1994;23:315-316. Laufer L, Schulman H, Hertzanu Y. Vertebral pneumatocyst: A case report. Spine. 1996;21:389 –391. Incidental intraosseous pneumatocyst. Appl Radiol.